I’ll bypass a long explanation of the obvious: I, along with many other people old enough to remember and those certain younger generations that found it later, loved The Muppet Show and the movies that it spawned. I hold Jim Henson in high regard. I think his puppet work still outshines the visual effects of today, mainly because even though his creations were puppets, there was something real onscreen. One only needs to take a look at the first Star Wars trilogy and compare it to the glaring shiny extraction of humanity of the second trilogy. There is a certain genius to the spirit of The Muppets that is hard to nail down. I will try to describe it as “ridiculous without insulting your intelligence,” or “knowingly ridiculous but never crappy to be making fun of how crappy it is.” The Muppets regularly tear down the fourth wall, inviting us in, saying it’s a movie all the time but somehow turning the neat trick of not winking at the audience too knowingly. When The Muppets tear down the fourth wall it’s not a ploy or an entreaty to make sure you’re not taking them too seriously. It’s an honest joke, never dwelt upon. Coming back to the big screen since 1999’s Muppets From Space, and with a viral marketing campaign that was pure Muppets, with inoffensive adult humor (spoofing The Girl With The Dragon Tattoo trailer was brilliant), this new Muppets movie comes courtesy of screenwriters Jason Segel and Nicholas Stoller. The How I Met Your Mother star Segel and director Stoller last teamed on Forgetting Sarah Marshall, and as you may recall, that movie had a vampire puppet show. Here, they team with director James Bobin, who worked on HBO comedies The Flight of the Conchords and Da Ali G Show. The result is as fun as you can get at the movies. 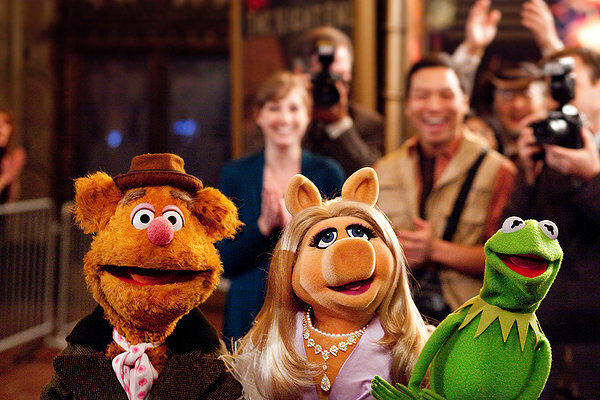 In The Muppets, Segel plays Gary, a bit of a man-child who has been dating his sweetheart Mary (Amy Adams) for 10 years. Most of the reason for this arrested development comes from Gary’s long friendship with muppet Walter (Peter Linz), who is obviously obsessed with the old Muppet Show and as someone who never met other muppets, is considered to be a bit fragile. Gary whisks Mary away to Los Angeles for a romantic getaway where he may pop the question, but he also takes Walter along with them. Conflict. One of the highlights is to tour the old Muppet Studios (Alan Arkin makes a guest appearance here), which is in disrepair. True to Muppets form, an entire plot development hinges on Walter sneaking into Kermit the Frog’s old office and overhearing an evil plot from oil baron Tex Richman (Chris Cooper), who plans to destroy the studio to drill for oil. But, there’s a clause in the sale that states if the Muppets can pay $10 million, they can own the studio with no interference. Walter gets busy telling Gary and Mary, and they happen to run into Kermit (long-time Sesame Street and Muppets voice Steve Whitmire). With Kermit’s help they round up the old gang including Fozzie Bear, Animal (Eric Jacobson), Gonzo (Dave Goelz), Rowlff (Bill Barretta), and with obvious diva attitude, Miss Piggy (Jacobson again), to try to get a show to raise money and buy back the studio. All the networks turn them down, until one called CDE (run by Rashida Jones) loses an episode of their hit show “Punch Teacher” (starring Ken Jeong), and needs to fill the time slot quickly. But they need a celebrity or else it’s no show. And of course that evil Richman is going to try to do anything he can to stop the Muppets from collecting $10 million. The songs are great, the gags are funny, and the movie will constantly put a smile on your face. It’s not just nostalgia and “look at us back when,” although that’s fun too, and it certainly runs circles around most kids entertainment. There are actually sharp gags, throwaway lines, off-screen banter, Easter eggs–the kind of things you put in family entertainment that makes everyone from age 2 to 90 thrilled to be watching. The Muppets influence cannot be ignored in today’s best family entertainment provided by Pixar. It’s a style that lacks cynicism or mean-spirited jokes. It’s a world you wish you could crawl into and stay there as long as you like. Bravo, all. This is a must-see for almost everyone.